Die Furstentumer: Waldeck, Lippe-Detmold und Schauenburg-Lippe. This is a fine example of the 1850 map by Joseph Meyer depicting the Principalities of Waldeck, Lippe-Detmold and Schaumburg-Lippe, Germany. It covers the historic region from Hanover and Steinhuder Meer south to Borken and west as far as Arnsberg. Throughout the map identifies various cities, towns, rivers and an assortment of additional topographical details. Waldeck, originally a county of the Holy Roman Empire, was raised to the rank of Principality along with Pyrmont in 1712. It became part of the German Confederation in 1815, was later administered by Prussia until it became a state in the new German Empire in 1871. It is part of the modern day states of Hesse and Lower Saxony. 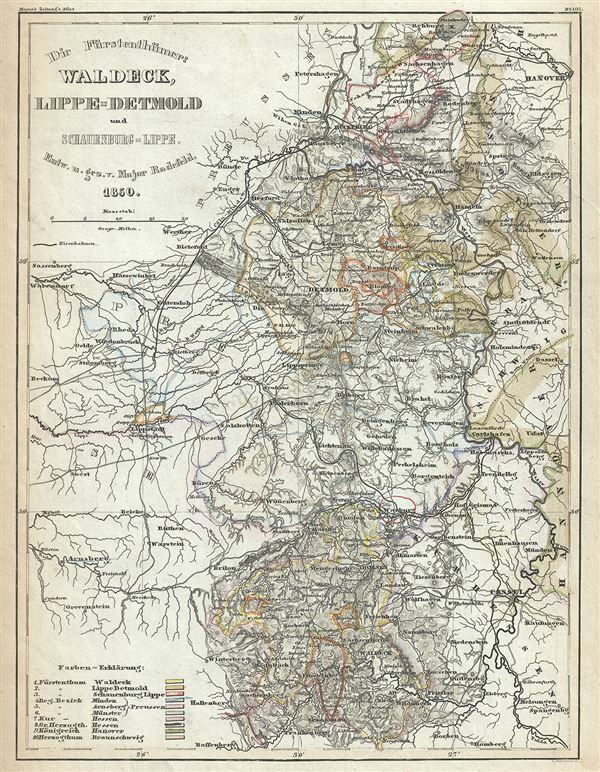 The Principalities of Lippe-Detmold and Schaumburg-Lippe would become states within the German Empire in 1871. Schaumburg-Lippe is today part of the German state of Lower Saxony, while Lippe-Detmold is part of the North Rhine-Westphalia state in Germany. This map was issued as plate no. 105 in Meyer's Zeitung Atlas. Although all the maps in this atlas are not individually dated, the title page and maps were often updated while the imprint with the date was not, causing confusion to the exact date for some of the maps. Moreover some maps in the atlas were taped in at a later date as an update to the atlas. We have dated the maps in this collection to the best of our ability.